The Tanti people are found across the northeastern portion of India. The greatest concentration is believed to be in the province of Bihar. 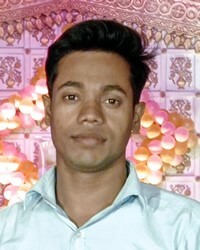 There are also some to the west in Uttar Pradesh, and east in West Bengal, as well as Bangladesh. Finally, they have also been documented south into Orissa. They tend to live in villages outside of major metropolitan areas. They are slightly less concentrated than some groups because their designation started with their occupation rather than a particular tribe or group. They tend to be mixed with other lower caste groups that are also spread throughout the region. This makes it difficult to identify any one area as specifically "tanti". There are, however, villages that have been found to be primarily Tanti scattered throughout the areas mentioned, again with concentrations occurring mostly in Bihar. The Tanti are said to have originated as the weavers, providers of cloth, back in history as far as ancient Bengal. They were known for great skill in weaving and the ability to produce both fine linens as well as more common everyday fabrics. Not too long ago, virtually every home would have had a loom and cloth present. Today, much of their trade has been taken over by factory production and imported goods. Many are now doing subsistence level work either of weaving or other manual labor within villages. They often do not have clean water or steady food supply. In relation to the rest of India they are seen as being part of the backward castes or the scheduled classes ("Dalit"). Evidence has been seen of both designations. Regardless of which is exactly right, they are definitely considered among the lower castes of India. They are also near the bottom of the nation economically. A few have moved into cities and achieved an education and greater roles in society. This is still, however, limited to a small percentage of the overall people group. 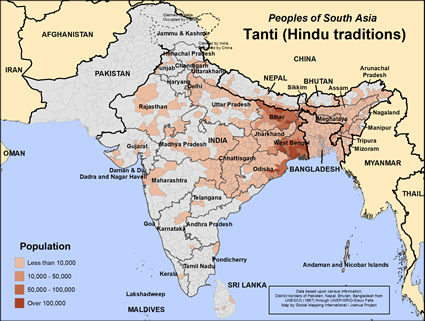 In terms of beliefs, the majority of Tantis are Hindu. Many are born into Hinduism and like others in India believe that to be who they are as a people means to be Hindu. There is also a sizable portion who are Muslim and this number continues to grow. One difficulty with this group, as with others in India, is to separate the cultural identity from the religious beliefs. As they understand that they can be Indian and Tanti, without being Hindu, it will ease the introduction and acceptance of the Gospel. They have a great need for clean water help with sanitation issues. Since so much of this group is found in rural India, they do not have ready access either to sanitation or medical facilities. Some groups are trying to help this situation by providing funds for water wells. View Tanti (Hindu traditions) in all countries.